I confess, I have a fascination with mourning customs of the Georgian era. I’m not sure how this interest developed, but I do know that I am drawn to objects that helped people express their grief at the loss of those they loved. Recently, I visited the Metropolitan Museum of Art in New York to see their exhibition entitled, “Death Becomes Her.” This exhibition focuses on the history of mourning attire from 1815 to 1915. There were a number of items that intrigued me. The portrait above was one. 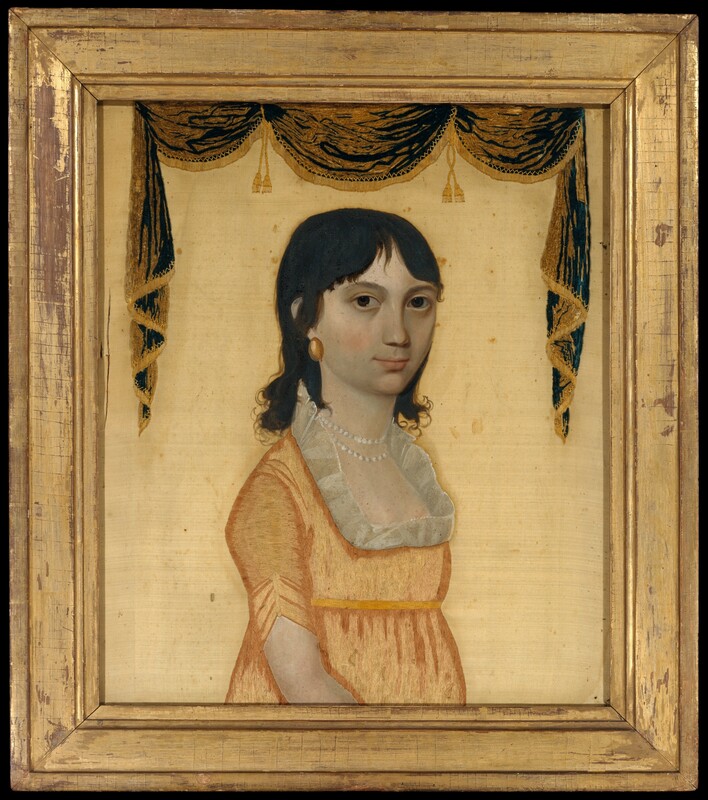 This portrait is of Catherine Lorillard, who was the daughter of the New York City tobacco magnate Peter A. Lorillard. She was born in 1792 and, according to family history, died from cholera while in her teens. The portrait is dated ca. 1810. Most early nineteenth century silk embroideries illustrate scenes from mythology or pastorals, copied from prints. Memorials, usually called mourning pictures, often included full-length figures standing at grave sites in landscapes appropriately featuring weeping willows. Catherine’s portrait is also a memorial, but in a different, possibly unique form. It was almost certainly painted posthumously, because the drape over her head is a symbol of death. Her head and neck were painted by a professional artist, perhaps based on a portrait from life. The embroidery was probably by one of her female relatives. Her expressive portrait, painted in oil on silk and embellished with silk and silk-chenille threads, is unlike any other needlework picture I have seen. What intrigued me most about this memorial, was that it focused on Catherine and not on the images of those she left behind, mourning her at her gravesite. I could understand her family wanting to have this piece as a way to keep Catherine close to their hearts. And for me, it gave me the opportunity to look into the eyes of the girl who must have been missed terribly by her family and friends. Thanks for sharing this on The Beau Monde’s Assembly Rooms.